The Alvarez Grateful Dead Ukulele Series brings you authentic, licensed Grateful Dead artwork presented on a fantastic, handmade concert ukulele with a warm, open tone. There are five different versions to chose from, each with its own artwork to commemorate special moments from the band's long, strange trip. The band was known for its constant touring and this is the perfect instrument for fans who want an instrument that is just as fun and mobile. Case sold separately. The Alvarez Veneta is based on art which was developed for the release of Sunshine Daydream, the Band’s legendary gig and film, which was made in Veneta, Oregon in 1972. The concert was staged at the Old Renaissance Faire Grounds on August 27th, although the music documentary was not released officially until August 1st 2013. The original artwork by Steve Vance depicts a skeleton with a flower headdress, with a hawk perched upon its hand. The Veneta is a great little instrument and its art captures a classical Dead era, a legendary gig and wonderful psychedelia. The Tattoo ukulele features mirrored images of the iconic Bertha skeleton and roses in black overlay, art that first appeared on posters for the Grateful Dead’s early shows at the Avalon Ballroom in San Francisco. Bertha (also known as Skull and Roses) was originally composed by Alton Kelley and Stanley Mouse, and became one of the most recognizable images associated with the Grateful Dead. The Tattoo design also includes a ring of Dancing Bears along the edge of the top, which were originally designed by Bob Thomas as a nod to the band’s producer and engineer Owsley “Bear” Stanley. The bears first appeared on the back cover of the album History of the Grateful Dead, Volume One (Bear’s Choice). The TATTOO captures classic Grateful Dead imagery in a tribal, resplendent pattern and absolutely comes to life when played. The Montage celebrates the Grateful Dead’s 50th anniversary and especially made for all the Dead fans who bought the montage guitar released in 2015, should they wish to own the set. The art draws upon a collection of wonderful Grateful Dead imagery. The sound hole incorporates the legendary Steal Your Face logo, originally designed by Owsley Stanley and Bob Thomas for the Steal Your Face (1976) album cover. A portrait o Bertha and her iconic roses also peers at us from behind the edges of the top, an iteration that first appeared on the band’s self titled album Grateful Dead (1971), designed by Alton Kelley. The words “50 Years” are flanked by bold and familiar logos of the “Good Ol Grateful Dead” and a classic Dancing Bear. The Montage beautifully captures 50 years of the Grateful Dead’s iconic artwork, and is not only inspiring to look at, but inspiring to play as well. 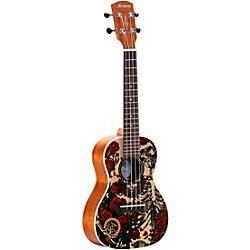 The Alvarez Grateful Dead Roses Ukulele features a full rendering of the iconic Bertha skeleton and roses. Also known as Skull & Roses, Bertha was originally composed by Alton Kelley and Stanley Mouse, who added color and lettering to a 1913 illustration by Edmund Joseph Sullivan. The artwork first appeared on posters for the Grateful Dead’s 1966 shows at the Avalon Ballroom in San Francisco, and quickly became one of the band’s most recognizable images. The Roses embraces a truly iconic piece of the Grateful Dead’s visual history, and is a delight to play. The Alvarez Grateful Dead Lightning Ukulele features an emergent rendering of the iconic 13-point Lightning Bolt logo created by Owsley Stanley and first appearing within the Steal Your Face logo on the album History of the Grateful Dead, Volume One (Bear’s Choice). The Lightning bolt is revealed between a cluster of Dancing Bears on the right, and iconic red roses on the left. Stanley originally designed the lightning bolt as a symbol to identify the band’s equipment on the road, but the striking imagery evolved into the band’s album artwork and other logos. The Lightning is a fantastic instrument, with a sound as colorful as the artwork it features. Download the Musician’s Friend App and receive personalized notifications, explore product reviews and gain access to your favorite brands and gear, anytime and anywhere. Sign up now to get email alerts for smokin' deals, new & hot gear, plus exclusive offers. Please note - If we sell out of any daily Stupid Deal before 4:00 pm PT/7:00 pm ET, we post a new Stupid Deal deal. If you reached this page expecting another deal, it likely has been sold out.